I never understood. For the six years we've known each other, I've staunchly refused to see the opposite of my frailty. On a warm July day this past summer, my back tanned in the Carolina sun and my legs lay comfortably on salt-and-pepper sand. My toes just touched the hem of the sea; it was warm, like bath water. In my hand was an Anne Lammott book. I had no real intentions of reading it. I sat, feeling blessed by the chance to read. 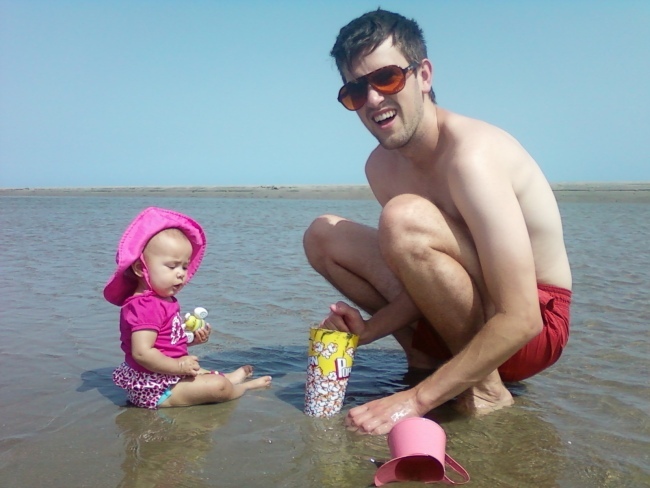 My husband built a sandcastle for our daughter, but she didn't care because she was only eight months old. Instead, she raked the sand with her dainty fingers and ate it. Every twenty minutes or so, my husband checked back in with me, for a drink fresh from our monogrammed cooler, or a reapplication of sunscreen. This was normal protocol for family day in Sullivan's Island. This is what we do there – on Saturdays, Sundays, Church days, lazy Tuesdays and on days when friends or family visit. It is our lather-rinse-repeat. Our very own ritual, the one that never gets old. It is our stay-cation itinerary, the one that allows us to vacate our life while still playing in our own backyard. We go there often, no matter the weather. This casual, unhurried beach captivates us. It is no tropical paradise but, to borrow my husband's words, there is something there. Strength, I think, is what he calls it. Sullivan's Island is the entrance to Charleston Harbor. In it stands Fort Moultrie, the site of a pivotal combat in the American Revolution. On June 28, 1776, Col. William Moultrie led Carolinian settlers in a victorious battle against the British, galvanizing the colonies' desire for independence. A dark blue flag with a crescent moon stood during the armed conflict, until it was shot down. Sgt. William Jasper picked it up and held it aloft until the flag could be remounted. The flag became symbolic of liberty in the state, the South, and the nation. This is my favorite of the many stories that capture the island's long military history. It is dearest to me because it is a story of resilience. It is a tale that shows that an army's greatest strength – like my own – is not its size, but its eagerness to pick itself up after being shot down. Also, I prefer this tale simply because I believe it. I am not one who readily buys every word written in history books. But when I sit in my L.L Bean chair at any point on Sullivan's three-mile shore, I feel as though I am riding a wave of prayers from of old – Here we fight, here we live, on these waters and this sand. So help us, God. There are too many broken pieces to my childhood for me to tell about it in its entirety. Some pieces relate to others, some are merely pieces. If you took a look through the kaleidoscope of my life, you'd find many glass beads, all dancing in a swirl, colliding often while creating on-and-off patterns of shape and color. Some pieces are actually jagged rocks, smoothed out to a shine by contact with others. If you look very closely, microscopically, this is what you would find: shattered goblets swimming in wine and blood, bounced checks and rotten orange peels drowning in my mother's purse, my brother and I paddling through lies, my progressively thinning frame and concaving core, torn puppets and naked dolls, my father's comrades toasting to the next failed venture, media coverage of the scandal that wiped away our everything. That tsunami passed nearly ten years ago. My husband waved at me from where he and the little one waded. I gave him a thumbs up, because his wave is his way of asking if I am doing alright. Shortly after, thick, dark clouds crept in overhead. Nobody rushed to their mats to pack up. In an unhurried pace, the families who had come there to play gathered up their things. No one was rattled by the thunder. I overhearD talks of coming back as soon as the storm had passed and the surf quelled. I suggested likewise as I picked up the baby. Ah, it was a good day – not only for the sunshine, but for Sullivan's promise of return. And that promise is what makes this beach a harbor. After all, what is a fort – a refuge – if it cannot stand against the threats of its invaders? Cinelle Ariola Barnes is a freelance non-fiction writer and creative entrepreneur from Manila, Philippines. She attended New York's Fashion Institute of Technology and also received a degree in Journalism and Art History from Hunter College. 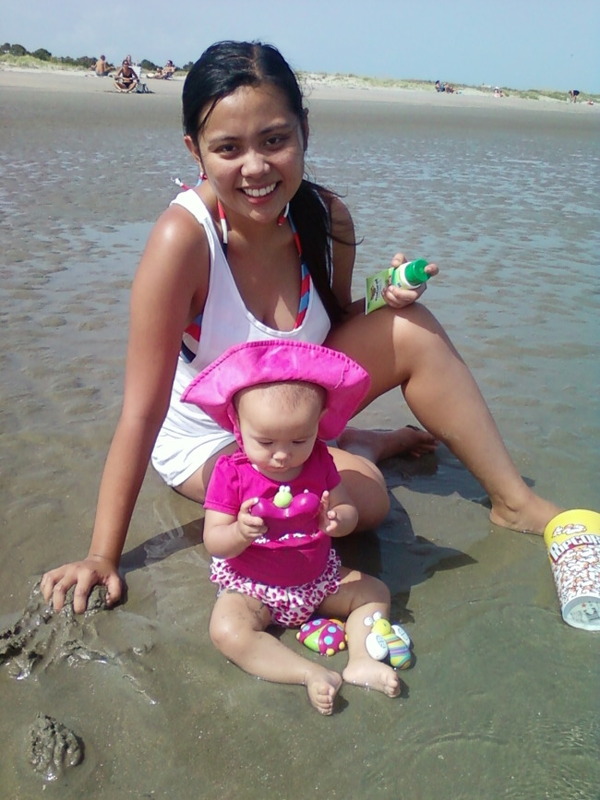 Together with her husband, daughter, pet Maltese, she makes her home in Charleston, SC. For more info, visit cinellewrites.tumblr.com.